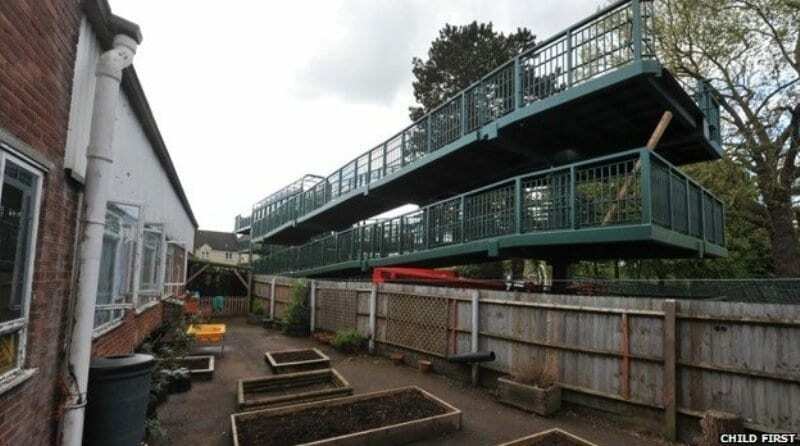 Childfirst Nursery in Bicester has requested compensation from Network Rail after a giant footbridge was constructed that now overlooks their play area and has forced them to shut off their vegetable garden to the children. Parents of the children who attend the setting have threatened to remove them, with manager Andrea Leonard stating that people can stand on the bridge and look into the play area. She has requested that the rail organisation pay to move their play area the the other side of the building where they will have much more privacy and not be overlooked. The cost of this is said to be around £180,000. Network Rail have so far refused the plan, and have proposed their own which involves erecting a canopy and screening on the bridge at a cost of £260,000. Mrs Leonard has expressed concerns that their solution will simply mask the problem, and Oxford County Council released a statement saying that Network Rail was working with the local councils to come to come up with a feasible plan. As yet no decision has been made, but where does this leave the setting? If this were your setting how would you feel? Would you feel comfortable sending your child to a setting where they are exposed?